Model analyses of an alongshelf flow over a continental shelf and slope reveal upwelling near the shelf break. 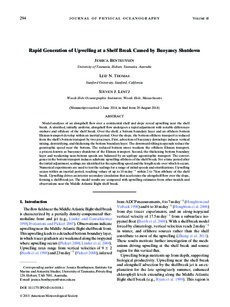 A stratified, initially uniform, alongshelf flow undergoes a rapid adjustment with notable differences onshore and offshore of the shelf break. Over the shelf, a bottom boundary layer and an offshore bottom Ekman transport develop within an inertial period. Over the slope, the bottom offshore transport is reduced from the shelf’s bottom transport by two processes. First, advection of buoyancy downslope induces vertical mixing, destratifying, and thickening the bottom boundary layer. The downward-tilting isopycnals reduce the geostrophic speed near the bottom. The reduced bottom stress weakens the offshore Ekman transport, a process known as buoyancy shutdown of the Ekman transport. Second, the thickening bottom boundary layer and weakening near-bottom speeds are balanced by an upslope ageostrophic transport. The convergence in the bottom transport induces adiabatic upwelling offshore of the shelf break. For a time period after the initial adjustment, scalings are identified for the upwelling speed and the length scale over which it occurs. Numerical experiments are used to test the scalings for a range of initial speeds and stratifications. Upwelling occurs within an inertial period, reaching values of up to 10 m day−1 within 2 to 7 km offshore of the shelf break. Upwelling drives an interior secondary circulation that accelerates the alongshelf flow over the slope, forming a shelfbreak jet. The model results are compared with upwelling estimates from other models and observations near the Middle Atlantic Bight shelf break.